Knicks Power Rankings: Welcome Back, Amar'e! Coach Mike Woodson's rotation is an ever-evolving machine with parts that grow, shrink, disappear, and switch roles constantly. As part of our Knicks coverage all season, we'll be tracking each player every Tuesday. Come join us for the Knicks Power Rankings! 1. Carmelo Anthony. (Last week: 1) It's as if Anthony is using the month of April as a concentrated crusade to compensate for his sagging numbers over the previous three months. Save for an unsuccessful, abbreviated outing on Friday against the Cavaliers (New York's only loss of the week), 'Melo continued on his scoring spree with three performances of 30-plus points. The first was his utter dismantlement of the Celtics, both with scoring and crisp passing out of double teams. The second was a 33-point evening in New Jersey (see ya, Nets!) that included an insane, unstoppable, spectators-fainting-in-the-stands 21-point frenzy in the first quarter. The third came on Sunday, when, even with Amar'e Stoudemire back on the floor, Anthony got his isolation touches and made the big buckets to steal the Knicks a win over Atlanta. All of this — the efficient scoring, the passing, the rebounding, the defense — is exactly the stuff we love to see days before the start of the playoffs. "Peaking at the right time" and all that. 2. Tyson Chandler. (Last week: 2) Chandler more than deserved the rest he got on Sunday in Atlanta. (And "rest" here means "staying on the bench but still jumping and shouting a lot.") He's played through injuries all season long and looked genuinely spent by the time the Knicks hit Cleveland on Friday. Before that, though, Chandler dunked all over the Celtics and Nets, lorded over the offensive glass, and rounded out a season's body of work that might very well win him the Defensive Player of the Year award. He's already locked up the "Most Thoroughly Awesome Knick of the Year" award and the "Knick Whose Shoulders I'd Most Like to Ride Upon" award. 3. Amar'e Stoudemire. (Last week: Injured) He's back! Amar'e, clean-shaven and cornrowed, returned to the floor on Friday in Cleveland. He looked spry but rusty, mishandling a lot of his touches and providing the sloppy, idle defense we've come to know and dread. Sunday was quite a bit better. With Baron Davis back on the floor, Amar'e got more pick-and-roll touches and scored around, over, and on top of Atlanta's undersized interior defense. Just gobbled 'em up. Stoudemire looked much more engaged on the defensive end, too. Mike Woodson's task now is to get Amar'e rolling like that when Chandler is still on the floor and filling the paint, or to strike the right balance with units that include one big man or the other. Probably a bit of each. 4. J.R. Smith. (Last week: 3) J.R. started this week with a bang, drilling seven threes — including five in the second quarter — in a delirious first-half against the Celtics. Somehow, he didn't end up breaking New York's single-game three-point record of nine in that game (Steve Novak actually got closer). Smith's shooting the rest of the week was on and off, but he hit some big ones to stifle the Nets' comeback on Wednesday. And, as has been the case, Smith made his presence felt even when he wasn't chuckin' Js. His passing at the top of the pick-and-roll has developed into a reliable weapon, he keeps coming up with steals, and his rebounding has been up in April. One or two huge shooting nights could make a big difference in any playoff series, but Smith's smaller, less obvious contributions are just as important. Eh, that's not really true. The shooting is way more important. That just sounded cool. The point is Smith's been pretty versatile as a Knick. 5. Steve Novak. (Last week: 6) Steve shot 17 of 30 from downtown this past week. He hit eight of ten against the Celtics, who left him waaaay too open. Don't leave him open. Teams that strap a defender to Novak's chest often make it out alive. Those who give him even an inch of space get punished. 6. Mike Bibby. (Last week: 9) Mike Bibby, guys! This man played an important role in two of the Knicks' three wins and got weirdly hot during their one loss! With Baron Davis ailing, Bibby played big minutes against the Celtics, then started in New Jersey and Cleveland. His only useful shooting (four of five from downtown) came during that loss to the Cavs, but he did a really admirable job of protecting the ball and passing it decisively without committing turnovers. Bibby doesn't have much to offer anymore, and he's become a bit of a punchline this season, but the guy deserves applause for staying relatively healthy, never griping about fluctuating minutes, and playing within his limitations. He shoots when he's open, passes when his teammates are open, and doesn't dare to try much else, and that's okay. You're all right, Mike Bibby. 7. Landry Fields. (Last week: 5) Fields continued to falter all week and actually lost his starting job to Iman Shumpert once Stoudemire returned to the lineup. Then, in the third quarter of Sunday's win, Fields went on a rampage. His sixteen-point period included three-of-three shooting from downtown, by far the best perimeter performance we've seen in months. (Of course, it still wasn't enough to get Fields on the floor in the fourth. Mike Woodson has his idiosyncrasies.) We learned afterward that Fields has been working with Allan Houston — a pretty okay shooter and the guy who helped Shumpert improve his J. It remains to be seen whether that outburst was some flukey spasm of accuracy or whether Fields is actually headed back toward the shooting numbers he posted last season. Again, that'd qualify as peaking at the right time. The Knicks need all the floor-spreading they can get, and that was the one thing that made it really tough to keep Fields on the floor in critical situations. 8. 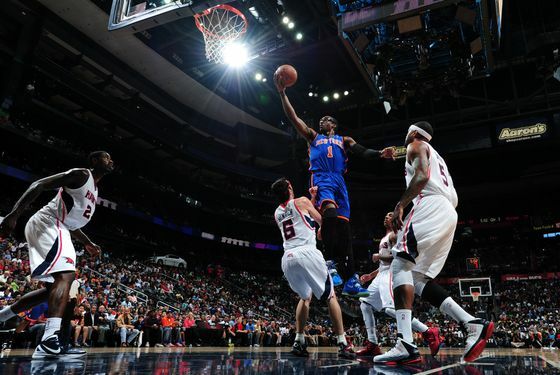 Iman Shumpert. (Last week: 4) Fields got the edge because of that huge quarter, but Shumpert didn't have such a bad week. Just a quiet one. He didn't score much and, presented with more opportunities to showcase his lockdown defense, didn't do much to stop Rajon Rondo, Kyrie Irving, or any of the Hawks. He did pretty much shut down fellow rookie MarShon Brooks on Wednesday, though. 9. Baron Davis. (Last week: 7) Baron apparently fell ill at some point during the Boston game and missed the next two with some combination of upset stomach and upset hamstring. He returned in Atlanta and looked startlingly fleet of foot, blowing past Hawk defenders to penetrate and either feed Amar'e Stoudemire for dunks, kick out to the perimeter, or just finish plays himself. When Davis has his legs under him, it's a sudden reminder that — oh yeah — the guy's pretty talented off the dribble. 10. Josh Harrellson. (Last week: 10) Jorts's only major contribution this week was getting unceremoniously swatted by Marvin Williams on an "at-rim" attempt that didn't actually approach the rim at all. He also kept wearing a handlebar mustache and added a black eye as well, if you count those as contributions. I do. 11. Toney Douglas. (Last week: 11) Toney got to spin during that Cleveland loss — mostly once the Knicks had pretty much surrendered — and somehow ripped down six offensive rebounds during his 21 minutes on the floor. So, that was cool. This week's Toneygram™: "Yo, go unsalted." That's Toney's advice regarding peanuts. 12. Dan Gadzuric. (Last week: a Texas Legend) New guy! Since Jared Jeffries's knee won't un-swell, the Knicks brought in everybody's favorite giant Dutchman, just in case they need somebody to grab some rebounds and give a few fouls in the playoffs. 13. Jerome Jordan. (Last week: an Erie BayHawk) The BayHawks got ousted in the first round of the playoffs, so Jerome's back on the Knicks' bench, doing whatever it is one does on the Knicks' bench. Sharing unsalted peanuts with Toney, perhaps. Waived: Bill Walker. We'll miss you, Bill.